Nike is unequivocally the best sports apparel brand in the world, and their range of shoes is probably the single most popular item that they put out. With such a strong focus on basketball, the brand inevitably puts out a whole heap of great basketball shoes, and these are a necessary part of any baller’s wardrobe. There are plenty of options to choose from though, so we’ve researched and compiled a list of the best Nike basketball shoes this 2019 season to help you settle on a pair. What makes Nike one of the most popular brands of basketball sneakers? Nike LeBron Soldier Xi Mens Basketball Shoes Review: It’s no surprise that Nike’s best basketball shoe also happens to be endorsed by the best player in the world. This shoe is as good as it gets. The high top shoe has lunarlon cushioning, ensuring it feels as soft and bouncy as possible, and with a full innersleeve, your foot will be comfortably wrapped up while still being able to breathe easily. This shoe is extremely lightweight, making it even easier to get up high for that big rebound, and a wedged carrier foam ensures you won’t be rolling your ankle in these shoes. On top of that, they look fantastic, ensuring you’ll feel confident in how you look as you wipe the floor with your opponent. All these factors combined mean these are overall the best Nike basketball shoes this 2019 season. Nike Mens Kyrie 3 Basketball Shoe Review: Kyrie Irving is one of the best point guards in the world, so it makes sense that the best Nike basketball shoes for point guards are named after him. These low top, synthetic shoes are designed to help you move like the Celtic star. They focus on increased grip and traction, meaning you’ll be able to cross-up your opponent with ease, and replicate Kyrie on the floor. They are a little more narrow than many similar products, which can be a minor issue for some users, but with the ability to move laterally better than any of your opponents, they’re well and truly worth it. This shoe also comes in a huge range of colors, meaning you’ll not only be able to show off your skills, but look good doing it. Nike Mens Zoom KD9 Elite Basketball Shoe Review: This shoe has all the bells and whistles that you would expect from a high quality Nike product. These flyknit kicks have a midfoot cage, which keeps the foot locked in position and gives it great support. The flyknit upper section also provides great stability, while allowing you to move freely, while the Visible Zoom Air midsole unit keeps your foot extremely comfortable. The flex grooves incorporated into this shoe move naturally with the foot to keep you support, while still maintaining the ability to move like KD, and the rubber outsole provides terrific grip. This shoe covers all bases, and will allow you to maximize your ability while feeling comfortable and looking good doing it. Endorsed by one of the best forwards of all time, these are the best Nike basketball shoes for forwards that money can buy. Nike LeBron XV Review: The Nike LeBron XV is the perfect shoe for the bigger, more inside baller. This shoe has heaps of cushioning, meaning if you’ve got a bigger frame it will minimize the strain on your feet. It is extremely durable, and able to cope with the demands that come with being a big man like having to constantly battle for boards, and work hard on the inside. The shoe loses out a little in terms of explosive lateral movements, which is why it is more suitable for bigger players who rely more on their frame than their quick feet. It also looks great, and is available in a wide range of different colors and styles. Another one which is endorsed by the game’s greatest player, this shoe will last you a long time, and you’re sure to be happy with the purchase. 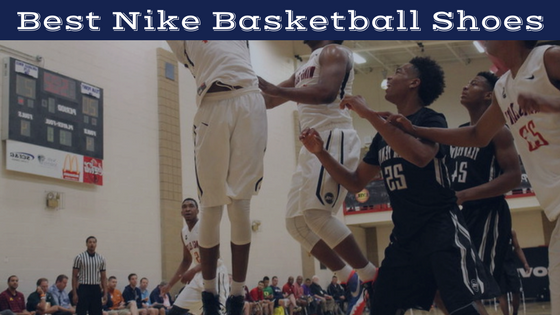 With such great cushioning and support, these are the best Nike basketball shoes for centers. Nike Men’s PG 2 Basketball Shoes Review: This option is a little less expensive, though a higher price would certainly be justified. The zoom air unit at the front of the shoe provides great cushioning, meaning you’ll feel comfortable in these all the way through a tough game. Containment on the lateral part of the shoe also helps to keep your foot comfortable and stable, so you’ll be less likely to roll an ankle as you weave past your opponent. It also has great traction, another factor which makes it easier to move laterally on the floor. It fits extremely well, is comfortable, and supportive, making this a terrific all-round product. At a fraction of the price of some of its competitors, it’s hard to go wrong with these shoes. Nike Kobe Mamba Instinct Mens Basketball Shoes Review: These shoes aren’t all bad. They look pretty good and are reasonably durable, but unfortunately it’s difficult to justify buying them because they are not at all comfortable. A very large portion of users complained that these shoes, despite being the right size, were far too tight around the midsection. This was the case even when the length was right, and the shoes were comfortable at the heel and the toe. Perhaps this provides extra support, but it is also uncomfortable enough that it’s difficult to even play out a full game in these. If you have an extremely narrow foot perhaps they will be suitable, but if you don’t, these are the worst Nike basketball shoes this 2019 season. Nike Men’s Air Versatile Basketball Shoe Review: This shoe simply has too many flaws to justify purchasing it. For starters, it doesn’t have particularly good grip or bounce, both of which are obviously vital reasons for purchasing a basketball shoe, and which can have a detrimental impact on your performance. They also aren’t particularly comfortable, with some users complaining they don’t fit as well as other Nike products. To top it off, they lack support, and using them regularly for competitive games of basketball can result in you getting some pain in your feet. Nothing about these shoes is outright terrible, but there are a whole bunch of defaults that make them a worse product than other Nike shoes. It isn’t the worst, but if you’re after a really high quality shoe, you should probably avoid these Nike basketball shoes. With so many great Nike shoes on the market, it can be difficult to understand the difference between them all. To make it a little easier, there’s a few important factors that you should focus on to help you choose the best pair of basketball sneakers for you. We’ve listed the three most pertinent of these below. Comfort: At the end of the day, there’s no point in buying what will probably be a relatively expensive pair of shoes if you aren’t going to feel good wearing them. Many shoes market themselves as having all sorts of new technology incorporated into them, but as is the case with the Kobe Mamba Instinct shoe, if you feel uncomfortable wearing them you’re not going to get the benefits. You’ll spend half the time out on the court worrying about how your feet feel rather than how to dunk on your opponent, and your performance will be hampered. A comfortable shoe will allow your foot to feel stable, while still maintaining an air of looseness and breathability, and will enable you to focus on the more important things out on the floor. Appearance: Though many of us would like to claim that we don’t really mind what our shoes look like and that we’re more concerned about the quality, in reality it’s great to have a shoe that looks great to complement your game. Nike have made a habit out of making extremely good looking products, and their shoes epitomize that. The shoes on the list above all look terrific, and it’s up to you to decide which of them best suits your style. Believe it or not, buying a pair of shoes that you like the look of can actually help out your game. If you look good, you’ll feel good, and if you feel good you’ll be more confident, enabling you to get the most out of your ability. Price: Considering the extremely high quality of Nike products, they do a pretty good job of ensuring the prices stay within an affordable limit for most people. That said, they certainly aren’t cheap, so it’s important to decide how much you’re willing to spend prior to starting your search. The most expensive of these shoes will cost you many hundreds of dollars, and while they will be exceptional shoes and will last a long time, not everyone is willing, or able, to part with that much money for a pair of shoes. At the other end of the scale, there are many cheaper Nike shoes that are still pretty good quality, a prime example being the PG range. These come in at around USD$100 and should still last a long time, making them a great option for many people. A whole lot of things. Nike shoes are the best of the best because they excel at virtually every area you can think of. They are generally made of very high quality materials, meaning they last a long time, and are able to incorporate some great technology to ensure your foot will be comfortable and stable. On top of that, they often have a lot of traction, making it easier to move from side to side, which, as we all know, is so important in basketball. Of course, Nike shoes also look great, and the iconic swoosh means your opponent will instantly recognize that you’re wearing the number one brand in basketball. This great reputation, combined with their fantastic products, are what make Nike basketball sneakers so popular. Nike make so many great shoes that sometimes looking for the right pair is overwhelming. That’s why it’s so important to consider what’s important in a pair of shoes prior to buying, and we’ve helped you to do that here. This review has also provided a comprehensive list of the best Nike basketball sneakers, meaning you won’t need to do any of the hard work, while elevating your game.